Memorial Day is a special day to honor those who have passed away while serving in the United States Armed Forces. These brave individuals fought to keep our country safe and are honored each year on the last Monday of May. Because Wheels For Wishes encourages giving back to the community and thanking the many people who serve us, we have plenty of ideas for giving back on Memorial Day! If you have other ideas of your own, we would love to hear them on our Facebook and Twitter pages. 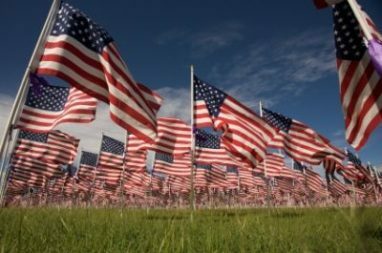 To give back on Memorial Day, visit a memorial site or veteran cemetery and set flowers or decorations on the graves that do not have anything on them. Encourage your friends and family to do the same. Split up different areas so as many gravesites as possible have at least one decoration. To create patriotic colors, you may choose to make homemade artificial flower bouquets that consist of red, white and blue flowers. Visit your local craft store and have fun with the project. This is also a great way to get kids involved in volunteering and to teach them fun and creative ways to honor people who deserve it. Have them help distribute the decorations so they can see how their hard work has paid off. To ensure that decorations do not get thrown out, visit them after a few weeks and collect them for later use. If you are able, bring them back every Independence Day, Veterans Day, and Memorial Day. Find out where Memorial Day parades and activities will be held in your area, and volunteer to help out. Whether you help set up for the parade or volunteer to walk in it, you will feel great about giving back. If you don’t see any events in your area, consider organizing an event. This is another great opportunity for getting kids involved on Memorial Day. Although Memorial Day is reserved to honor those who were unable to return home while serving in the United States Armed Forces, Memorial Day is also a great time to help those who did return and are struggling with hardships. Whether a veteran is wounded or dealing with other obstacles, they can use your help. Consider organizing an event that will benefit troops in your community, such as a fundraiser, food or clothing drive, or host a BBQ or potluck to simply thank them for all that they have done. A care package is important in so many ways. It can help troops that are currently fighting for our country by giving them hope and joy, while also providing them with different types of daily benefits. Troops would love receiving items that will help them day to day, such as trail mix, candy, pain relievers, tooth paste, mouth wash, cough drops, pen and paper, books, etc. Your care package will brighten their day and also make their lives a whole lot easier. Wheels For Wishes is all about giving back to the community. If you are looking for a different way to give back to your community on Memorial Day, why not donate a vehicle to Wheels For Wishes, benefiting Make-A-Wish? Even though your vehicle donation is not a traditional way to give back on Memorial Day, your donated vehicle will benefit a local child in your community. It will make the veteran in your life very proud. Plus, many Make-A-Wish Wish Kids hope to meet a soldier or to act as a marine for a day, such as Make-A-Wish Orange County and the Inland Empire Wish Kid, Jorge. To read Jorge’s Make-A-Wish Wish Story, please visit the Make-A-Wish website. Consider donating an unwanted vehicle in honor of the veteran in your life. It is something that you will feel proud of for years to come! You feel great knowing that your used vehicle will allow Make-A-Wish to turn the vehicle into a wish come true for a local child. To donate a vehicle to Wheels For Wishes, benefiting Make-A-Wish, please call 1-877-431-9474 or visit our website at https://www.wheelsforwishes.org/. If you’d rather make your donation online, simply fill out our easy vehicle donation form. Your vehicle donation can help grant a wish for a local child, and maybe even allow them to meet a solider at home. All of this can be made possible when you give back to your community on Memorial Day.